Going beyond the Global Handwashing Day (GHD) campaign, Manila Water Foundation (MWF) teams up with subsidiaries, schools and private organizations to bring water access, sanitation and hygiene (WASH) services to pupils and staff of Ambuetel Elementary School in Calasiao, Pangasinan and Longos Elementary School in Malolos City, Bulacan this November. Three hundred sixty-three pupils from Ambuetel Elementary School can now have access to clean and potable water and practice better handwashing habits through the construction of a drinking fountain and a handwashing facility. This initiative is in partnership with Calasiao Water Company and Calasiao Water District with cash donations from a BPO entity, Microsourcing Philippines. Mrs. Rowena Castro-Bandong, the School Principal, expressed her gratitude for the initiative. “We are very happy indeed, because this is the first time that Calasiao Water will be teaming up with a school, and we are glad that our school was chosen for this benefit—the drinking fountain and handwashing facility,” she said. Ms. Daryll Facun, the School Teacher and Science Coordinator of the school, said that the facility can help address the school’s hygiene needs. “Most of our pupils live below the poverty line. Some go to school without taking a bath or brushing their teeth,” she said in Filipino. “Our existing washing area is not enough for the 363 pupils that we have. It is a big privilege and honor for us to be chosen for this benefit, so our pupils can better practice their hygiene habits thus maintaining a good health,” she added. Meanwhile, 124 pupils from Longos Elementary School in Malolos City, Bulacan learned about proper handwashing and received hygiene kits from sponsor, Cleene. The initiative is in partnership with Bulacan Water, City Health Office of Malolos and Barangay Longos. Mr. Roy Gonzaga, Operations Manager of Bulacan Water, shared his view on the partnership. 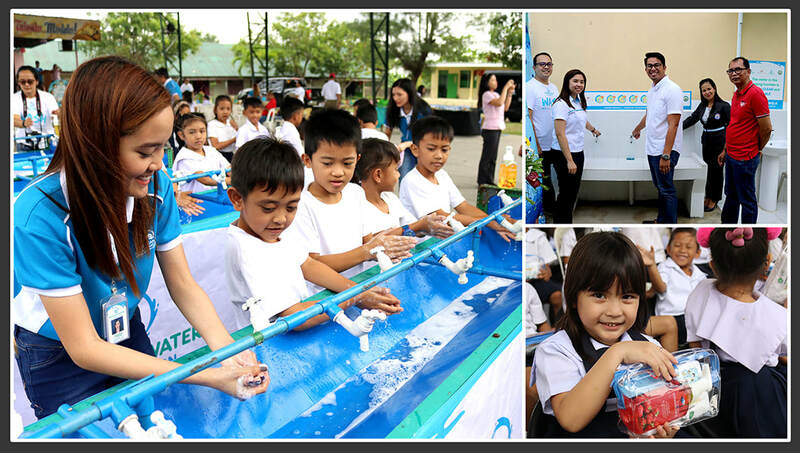 “Working for Manila Water means doing business with social responsibility. By heart, I believe in that statement. Our initiative of extending water access to this school as well as partnering with Manila Water Foundation for this campaign would be very helpful for the pupils as well as the communities around it,” he said in Filipino. These collaborations were under MWF’s flagship program, Lingap Eskwela. Through this program, public institutions such as schools are provided with water access through the construction of handwashing and/or drinking facilities. To incorporate better hygiene practices in having access to clean water, this is usually coupled with Health in Our Hands, a program for educating communities about proper handwashing and the importance of hygiene.